If you love cooking up a storm in the kitchen, you’re probably constantly on the lookout for new and exciting dishes to add to your repertoire. Yes, you’re probably fed up of eating the same ol’ meals over and over again, and you want something to spice up your life. Literally and metaphorically. One of the best ways to try out a new recipe is to throw together two of your favorite foods. This might be garlic bread and pizza, this might be zucchini and spaghetti, and it even might be vegetable soup and cheeseburgers. 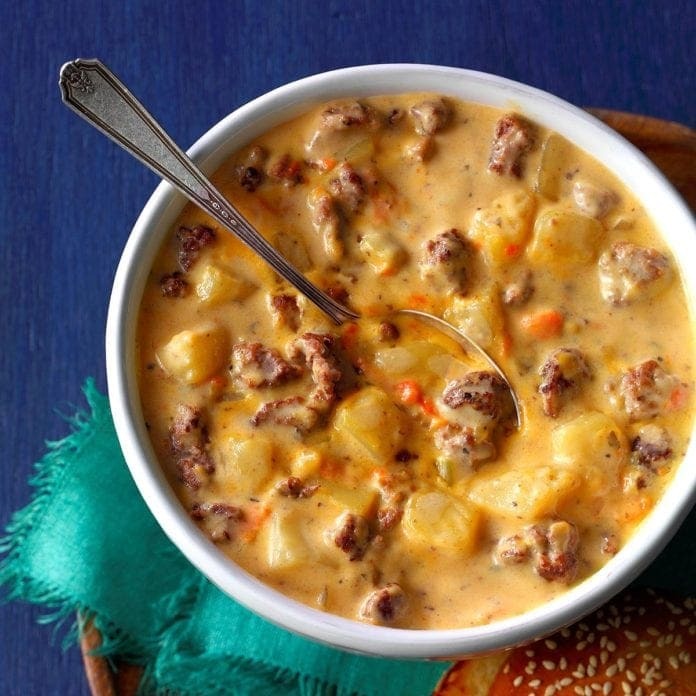 You read that right, this is why cheeseburger soup could be your new favorite dish. From the outset, cheeseburger soup doesn’t sound too appealing. You probably have images of wet and soggy soup that offers floating bits of gray meat in it, and you probably want to avoid it at all costs. In fact, it’s the kind of thing that you’d scroll past on Pinterest and wonder why anyone would put such a thing in their mouths. However, when you do give it a go, you’ll soon realize that it’s a match made in heaven and that there is a method to the madness. After all, if you love soup and you love cheeseburgers, there’s no reason why you wouldn’t love it. To make cheeseburger soup, you’ll need a fair few ingredients and about 10 minutes prep time. Yes, you need bacon, onion, celery, carrots, minced garlic, ground beef, salt, pepper, mustard, tomatoes, chicken broth, cheddar cheese, half and half, all-purpose flour, and pickle slices and sesame seeds for serving. When you cook everything together and top the whole thing off with the bacon pieces, the cheddar, the sesame seeds and the pickles, you’ll soon realize what all the fuss was about. 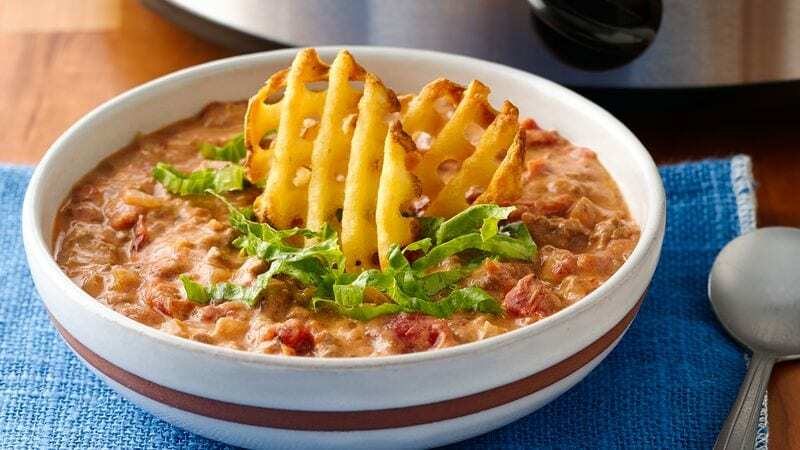 In reality, this cheeseburger soup is just a fancy version of a vegetable beef soup, but also offers all of the little added extras of a cheeseburger. It’s not sloppy, it’s not soggy, and it really does taste like a cheeseburger in soup form! What more could you want? If you’re currently planning a dinner party and don’t quite know where to start with your menu, why don’t you give this cheeseburger soup a go? What’s the worst that could happen?